Water Filters for Complete Fluoride Removal, Arsenic Removal, Lead Removal, Hexavalent Chromium Removal, and All Other Forms of Contamination Removal from Drinking Water. The only part visible in your kitchen after installing the 300-Series system is this attractive chrome faucet! 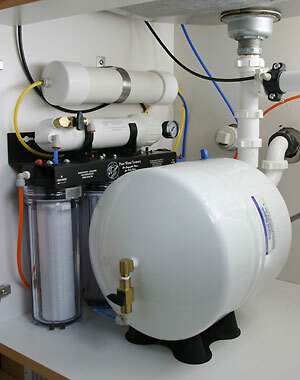 The new BEV-300 Series under-sink water filters are designed for the homeowner. These purifiers outperform every other residential water filter on the market. Test us against any other purifier (even distillers) to see the difference yourself. PWS™ BEV300 water filters install easily beneath the kitchen sink and provide 100% pure BEV quality water through an elegant sink mounted chrome faucet. 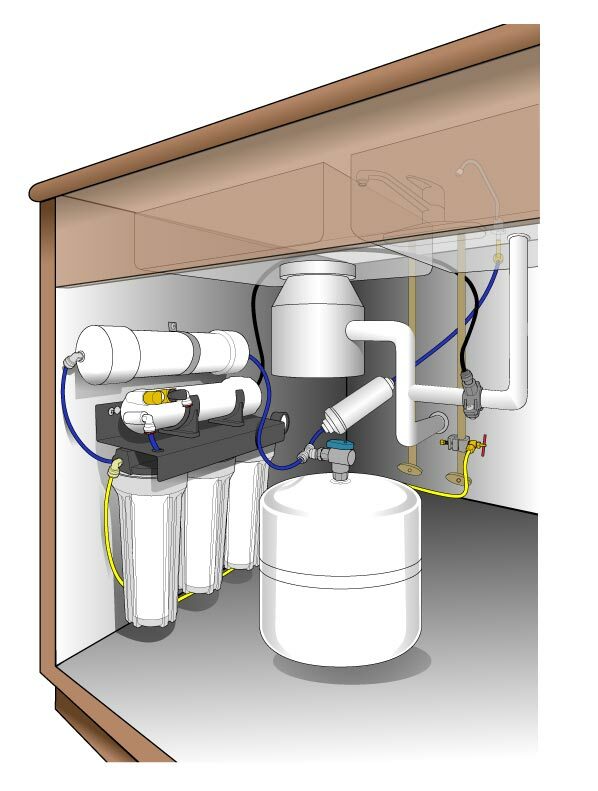 Watch our new animated video to see how easy it is to install and maintain the BEV300 system. PWS™ BEV-300 water purifiers utilize a patented reverse osmosis and deionization process to completely remove dissolved salts, nitrates, heavy metals, chemical pollutants, pesticides, and disease causing waterborne bacteria and virus (EPA EST. NO. 52531-FL-01). All components are NSF Certified and/or FDA approved materials. Our designs have been laboratory tested and certified to conform to currently recognized BEV standards for pH, rH2, and resistivity. PWS™ BEV-Series appliances offer the ultimate in water purity and bio-compatibility. For those who desire alkaline water, a remineralization filter (PWS-pHPlus™) has been developed which will raise the pH of the purified water to ~9.5. The pHPlus™ module provides a superior alternative to expensive alkaline water machines which are not able to remove all dangerous toxins from your drinking water. What good is alkaline water if it contains dangerous chemicals? Twin, unidirectional granular activated carbon pre-filters using clean, steam washed, bituminous grade carbon. Flow is length-wise, not radial, for maximum contact time and organic adsorption. Other manufacturers include only a single carbon pre-filter, often using less efficient coconut shell carbon which can contain metals, arsenic, and phosphorous. “I want to thank you for developing the BEV-300. I began searching for an exceptional purification system after my 2-year-old son was diagnosed with autism. Autism is occuring in epidemic proportions and envirionmental toxins appear to play a major role. Many autistic kids are extremely sensitive to toxins in our air, food and water... even trace amounts. I needed a system that would filter out everything - from sediment and heavy metals to chlorine and fluoride (two known neurotoxins). I wanted to make sure the only thing I was putting in my son's body was pure water. Your system answered that call. In addition to meeting all my requirements the BEV-300 fit nicely into my sink cabinet and was easy to install. The real bonus: its the best tasting water I've ever had! Our exceptional reverse osmosis membrane provides consistently high rejection rates, even when installed in real world scenarios. Off-the-shelf membranes used in the majority of RO products simply do not provide the consistency necessary to ensure BEV quality water. Outside of laboratory conditions other membranes seldom meet their stated specifications. 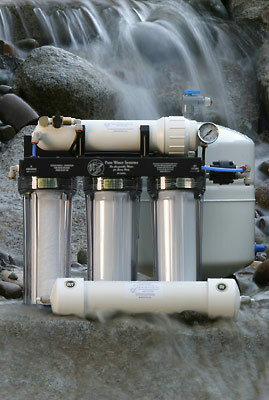 This unique multi-stage module contains a proprietary blend of deionization resins (which capture any contaminants not removed by reverse osmosis) followed by several inches of carbon to polish the water for exceptional taste, ending with two stages engineered to block any backward migration of contaminants into the system. Black anodized all aluminum modular bracket resists rust and corrosion while providing a lifetime of support. Clear, see-through housings make it easy to see when filters need to be replaced. Impact resistant quick lock fittings assure leak free connections making filter changes fast and easy. 4-Gallon (3.2 gallon usable volume) pressurized holding tank now includes a stainless steel fitting as standard. Attractive long reach chrome faucet. The PWS™ BEV-300 Series appliances ship with the necessary installation hardware and a complete User Guide which provides detailed installation instructions. Under typical conditions, the PWS™ BEV-300 system will produce pure, BEV quality water at a rate of ~1.6 gallons per hour. For extremely low water pressure situations, a virtually silent booster pump is available. The best warranty in the industry! We are so confident in the quality of materials and components in these systems we provide a lifetime warranty (exclusive of module changes and abuse). Our systems are designed to last decades, not months or years. Should any part ever fail, we will repair or replace it free of charge. With a cost of ~12¢ per gallon*, the PWS™ BEV-300 systems pay for themselves very quickly when compared to bottled / delivered water which averages ~79¢/gallon. If you use 3 gallons per day, you'll save over $500 per year! Plus, you'll have confidence you are providing your family the ultimate in pure drinking water regardless of whatever new, toxic chemical is found next in our water supplies. Proprietary valve allows for periodic flushing to remove concentrated contaminants— increasing efficiency and extending the life of the RO membrane. Only Pure Water Systems includes a tap water pressure gauge to ensure ample pressure for maximum membrane efficiency and rejection of contaminants. Only the PWS™ BEV-Series include a multi-stage deionization module after the RO membrane, ensuring complete and total removal of all contaminants. * Amortized cost over ten years including annual maintenance costs and replacement of reverse osmosis membrane every three years.